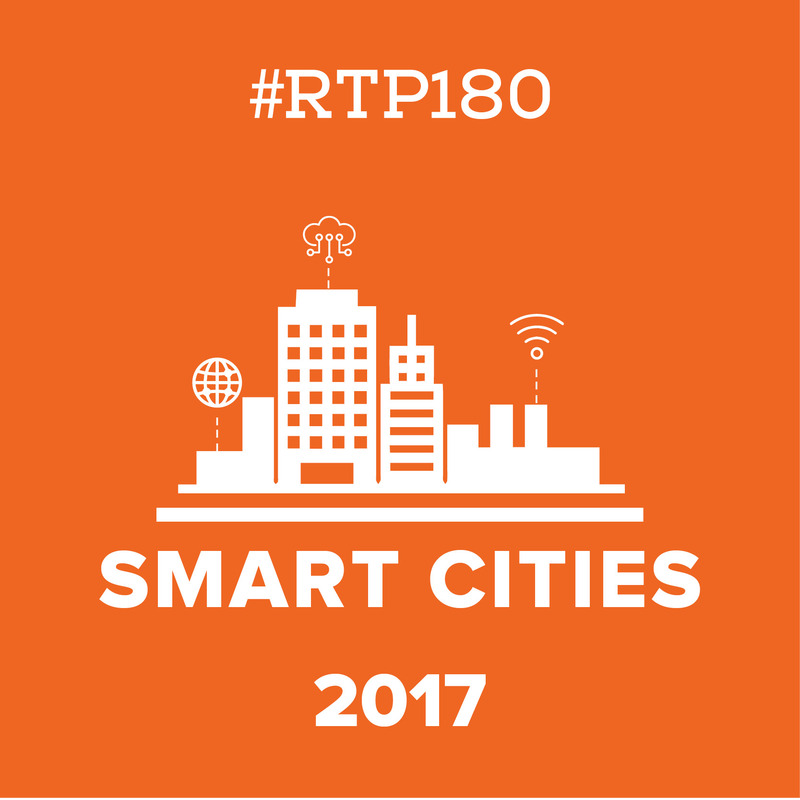 At this month’s RTP180, we invited some of the area’s smartest “smart city” experts to share their stories and passions. While I do my best to recap these talks for you, as always, I would encourage you to watch the full program HERE on YouTube. This talk could not have come at a better time for me personally as my wife and I were just hit with a $300 water bill from the City of Raleigh after moving into our new home in Wendell (just outside the beltline). The bill explained that during the first month of living in our home we used an average of 60 gallons of water a day. OK I thought, seems reasonable. However, the second month of water usage averaged 430 gallons a day. DO WHAT?! I didn’t dig a pool in the back yard! I immediately called our builder who then put me in touch with the plumber who then came out to look at our digital meter. It sounds like we’ve determined that the meter is not accurately measuring water usage. It is counting water usage 4x as fast as it should. My wife and I scratched our heads and immediately asked the plumber “Well, isn’t there a way the city can tell that this is happening? All of this is digital so wouldn’t you think someone would look at this and go “This seems way off”?” The problem here, and it’s one that some of our speakers outline, is that there is a flood (pun intended) of data coming in from these systems but cities haven’t figured out a way to connect all the dots just yet. It still takes a physical plumber to come out and look at a meter while running various water tests to determine that it’s counting too fast. Let’s hope our cities can quickly catch up. Perhaps our speakers can shed some light on this, let’s dive in and see! Urbanization – rural population is becoming more urbanized. In fact, by 2050 we will be an urban planet with more than 6 billion people living in cities. Today, 2 out of 3 people living in North Carolina live in an Urban Community. Aging Infrastructure – A trend we certainly see right here in Raleigh as the infrastructure continues to cause problems for older cities. Technology Costs – More and more sensors are being used to measure and monitor activities within a city’s infrastructure as costs continue to go down on this technology. These are the drivers for smart cities, but what solutions are cities implementing? For that, you’ll have to watch Susan’s talk. If you’ve read several of these recaps, you knew that was coming! Arguably the shortest RTP180 talk we’ve ever had. Ian accidently hit the “back” button on the clicker to Susan’s “thank you” slide and received a round of applause. Ian kicks off his real talk by asking the audience, “Who wants to live in a dumb city?” Of course, no one that I could see raised their hand. It’s obvious that we all prefer to live in a smart city than a dumb one. A city though, has a lot of data coming in from plenty of assets such as schools, libraries, power plants, waste management, law enforcement and many more. In fact, there is more data coming in than a city can really handle. Unfortunately, a lot of the data coming in doesn’t connect and if we can’t connect all the data, we will continue to live in dumb cities as we will keep doing the same thing the same old way. True smart cities combine data from public and private assets (and citizen crowdsourcing). For example, London provided free wifi on their underground railways to track where people were going. Up until this test, London only had an idea of entry and exit points, but they did not understand how people were using the rail system. Again, Ian drives home the point that all this data is great, but it comes in like a tsunami wave. The flood of data is just the beginning of the problem. The data coming in doesn’t connect, it’s in different formats, language, etc. This cause one massive problem for a city. The solution – an open city. Creating a way for all the data to be accessed by everyone. Ian explains several steps on how a city can do this, but you’ll have to watch his talk to get this info. Honestly, he explains it much better than I can anyways. Terry joins us to share what the town of Cary is doing to continually become smarter as a city for its citizens. He shares that the most important aspect of a smart city is using the data it collects to solve problems for its citizens. In a nutshell, Cary looked at the top recurring problems, leveraged internal and external (city partners) existing platforms to solve those problems, and created an implantation strategy to fix those problems. The implementation plans started small with existing infrastructure to help keep costs down before rolling out the solution to the entire city. Terry dives deeper into Cary’s Innovation Experience Center along with other details about Cary’s current game plan to continue leading the smart city charge in his talk. You’ll want to watch this one! Smart networks for cities already exist. To prove his first point, Charlie jumps in to what he calls the “Philadelphia Story.” He explains that the city of Philadelphia reached out to his company for help with showcasing smart city technology during the Democratic National Convention. So Sensus (where Charlie works) deployed a solution that leveraged existing smart grid assets to create smart lighting. It allowed for real-time lighting control for efficiency and public safety. They could brighten the lights for an event, dim the lights late at night to conserve energy, and even flash them on and off to celebrate Hillary Clinton’s nomination. To prove his second point, Charlie explains that vendors are chasing the larger cities like Chicago, Singapore, and Amsterdam. Most people think of Austin as a cool and hip city, very forward thinking and progressive, but if you’ve ever made your way to east Austin, you’ll see a stark contrast from the main part of town. Which smart solutions can be scaled to the smaller cities like Cary, Wake Forrest, Wendell? Will these smaller cities be a “have” or a “have not” when it comes to implementing these smart systems? Will the digital divide leave the small cities or even pockets of larger cities in the dust? To hear more about the Philadelphia Story, the digital divide, and answers to some of the above questions – you’ll have to watch Charlie’s talk. DON’T MISS next month’s RTP180. May’s topic is Animal Behavior. Prepare to be inspired and amazed at what local animal researchers, scientists, and behaviorists are discovering and working on. Stay tuned!